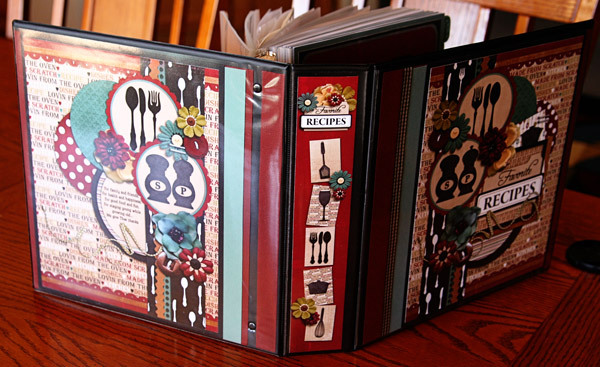 What an awesome recipe binder! Heather and Melissa should totally scoop with you and sell these as a set of printables! I would so buy a set! LOVE this, Mary! 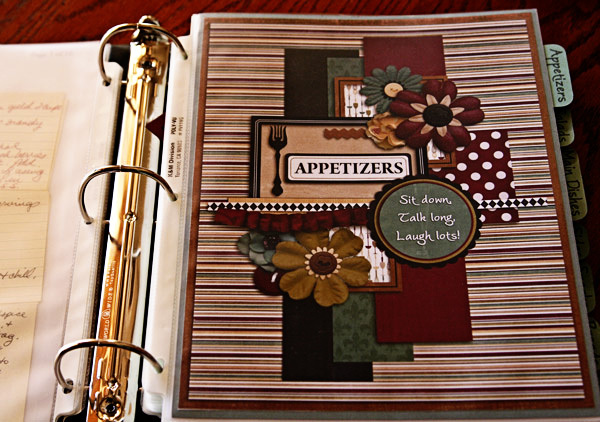 I'm about to embark on my own recipe binder project this year -and this is a great inspiration! I absolutely love your binder. I like the idea of using the page protectors too. I think you might be inspiring me to start this as one of my projects this year. 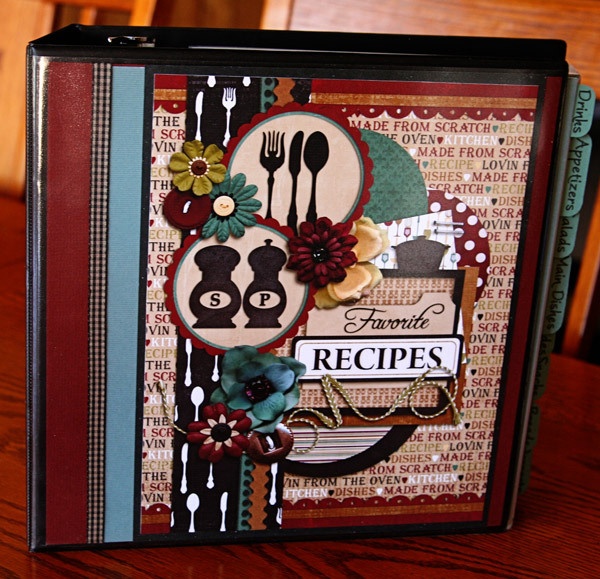 I had started a recipe photo book but I like the idea of being able to add to a binder any time. Oh i love this!! my favorite part is the fact you didn't re-write or change anything about the look of the recipes. I love keeping things classic. OMGoodness Mary this is amazing! (also wth I've never seen that gorgeous kit before! lol) I love how you've divided your book and YAY you for putting it all together! 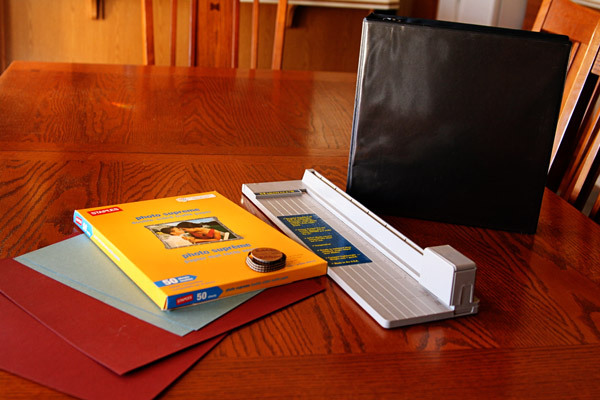 :D I do have a few recipes I was thinking of putting into cards then laminating it, because while the binder is an awesome idea, it's kinda bulky for my tiny kitchen. Of course I have yet to do this since I hardly cook BWAHAHAHA. 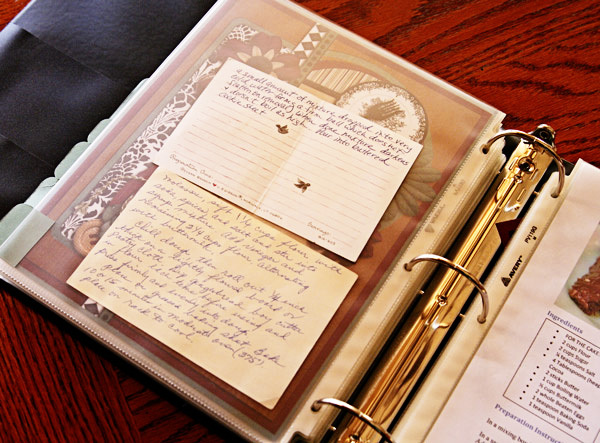 Your binder is gorgeous! Maybe that's what I should've done. I made a recipe box last year but never use it. 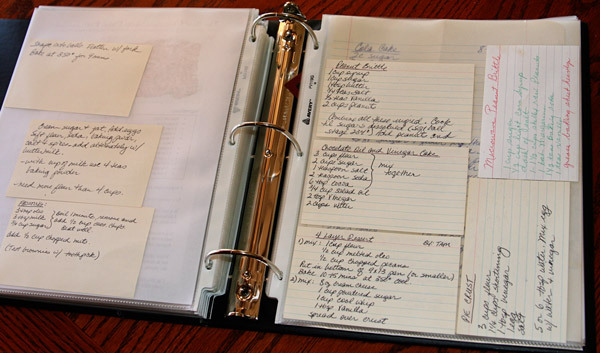 (I don't have many recipes in it) Did you have a bunch before? It says you had some from your parents, did you add new ones? I love this idea so much!! I want to make my mom one for Christmas! How does this work? I went to the website..do you order it and create it at home with the tools given? I thought it was all created online but I don't understand how to start! Hope to hear back from you! Wow! This is beautiful! Thanks for the inspiration! I have a binder. 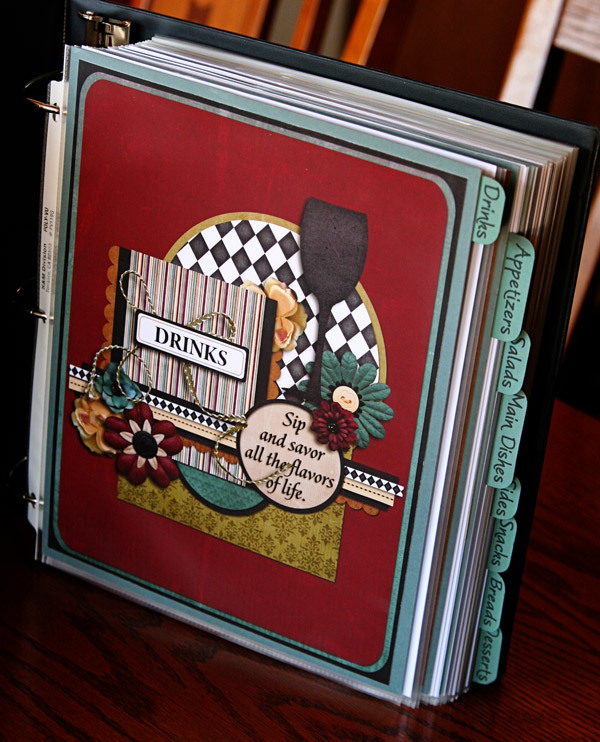 Each page is decorated with stamps and punches from Stampin'Up! My mom a sister and I made them in a group. We shared embellishments from various sources. After Mom died, I gave her binder to my baby sister, who couldn't attend our sessions. 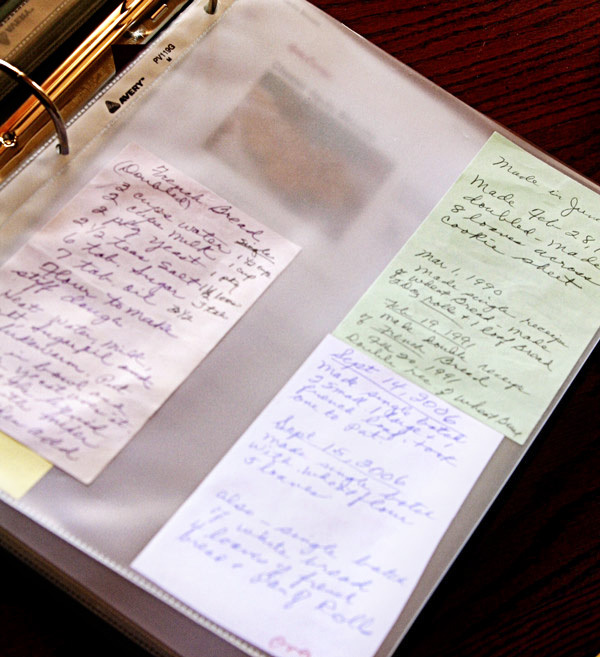 Mom made me write all of her recipes by hand. Wow so cool! That is one special book. 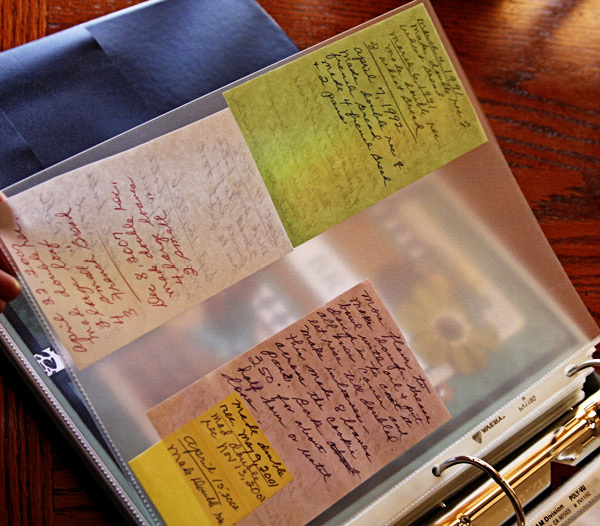 Very nice that you included the notes from over the years also. I need some extreme help!!! 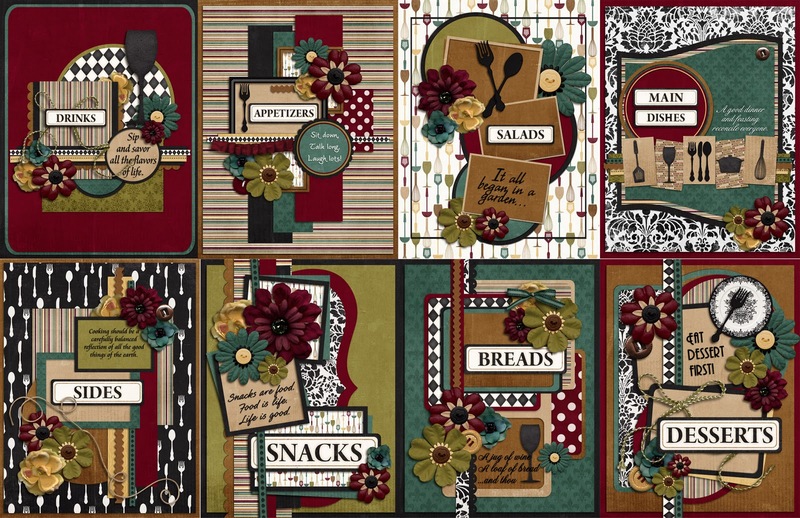 I have bought this kit but I have NO IDEA how to make a "scrapbook look" using my mac!! The only way I can think of to get it to look like yours is to print off each and every piece in the kit then cut it and glue it on... I am not that tech savvy as you can probably tell. 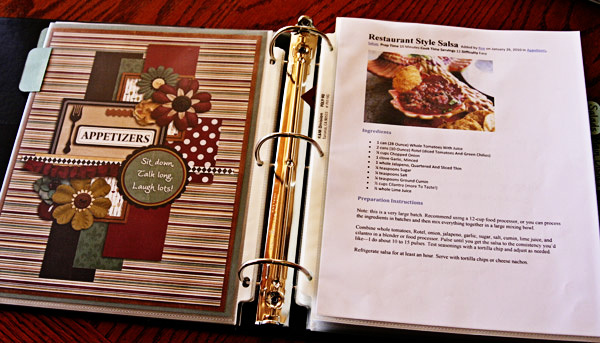 I just found your recipe binder, and I have to say it is absolutely amazing!! It is one of the best I've ever seen. I've bought the kit, but I'm having trouble with the templates. I would like to create one that looks similar to yours, and I was just wondering what templates you used. I would really appreciate any help you can give me, since I am very new at this. If you can help, my email is gleek2266@yahoo.com. Again, I would appreciate any help you can give. Thanks! 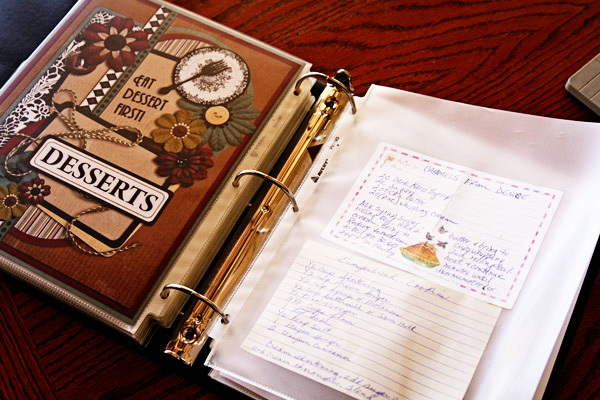 I just love your recipe book. I was wondering if the pages you got for each category is there a printable by chance??????? 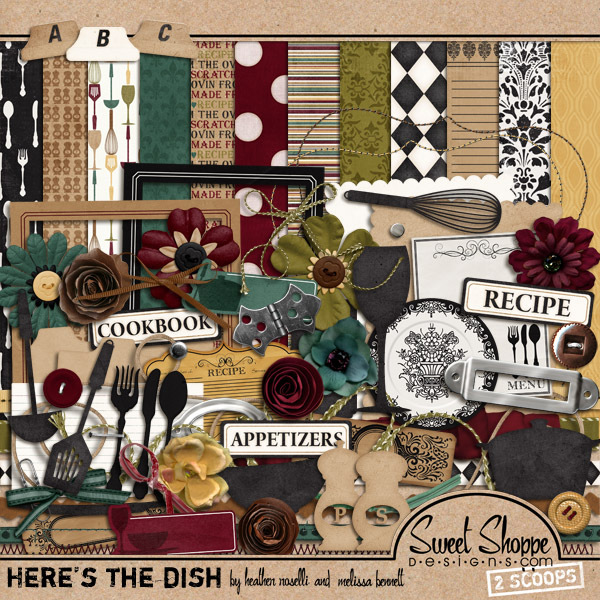 I been trying to find one that O can download and use for my new Recipe book that I am trying to put together. Or if you know where I can download please e-mail me at owens_92@live.com. Thanks again!!! I have been trying to make one for years by typing everything out....this is way better and gorgeous also!!! Thank you for sharing! Good morning! I was wondering if you would sell these pages? I would pay for a set also!